So, this is Part Deux (Jean Claude van Damme...anyone?) Honestly, there is nothing French about this post other than the laissez-faire manner in which you're going to let me share with you our homeowner's nightmare, and the grace you find in the integrity of an honest man's work. So go grab yourself a coffee and croissant, and if you have not read Part One, you need to do so in order to appreciate the gravity of the situation that befell us just after the New Year!! With the discovery of the burst elbow heat pipe now made, and the realization that I can control the amount of water emptying into my basement (a little), it is time to start thinking of “How is this going to get fixed and fast!” I had yet to make any calls. Naturally, options start to come to mind even though I already know who I’m calling first. But what are the options here? Local large HVAC company. The Oak Park area has a few great HVAC contractors. I have worked with a number of them in my real estate dealings. Most are quite knowledgeable when it comes to hot water pumped boiler heat. Unfortunately, I got burned once (pun?) and it has haunted me ever since. Call the one man that knows my house about as well as I do. The man that has installed 3 separate air conditioning (full steel vents, not space pac) systems in our house, one boiler floor radiated heat system in an office, moved countless radiators throughout the years, has shown up at all hours of the day to service the huge Burnham main boiler...and that is just this current house! This man also installed one of the coolest (not like cold, but clearly geeky cool) hot water heated, forced air system in our first Oak Park home on a 2nd level. Hot water heated forced air avoids having a gas-burning furnace on the bedroom level; something that was important to me. So how did I meet this HVAC contractor who would ultimately become an extension of the family, Wayne Borkowski of Alpine Heating and Air? It was 1996 and Julie and I had begun a renovation of our first Oak Park home at 923 N. Marion. We had a classic heating system known as a “dual-shot” vapor system. Very common in larger vintage Chicago apartment buildings, but very rare in a single family home. View it as a form of steam heat but more efficient and more of a vapor than a heavy steam. The gas-fired boiler burns up a smaller pot of water that sends vapor to the radiators through one pipe. When the vapor cools, it starts to return through another pipe system creating a vacuum at the same time. That vacuum then pulls more vapor off the top of the boiler pot and sends more heat to the radiators. Two shots (dual shot) of vapor for every burn of gas to heat the boiler! Well, the thing stopped working in the middle of the night. We had just started working with the HVAC guy recommended to me by my brother who was living over on the 900 block of north Euclid at the time - Wayne of Alpine Heating and Air. But I didn’t have Wayne’s cell at the time, or not thinking clearly at 12am, I opened the phone book and called the first local company that advertised emergency 24-hour service. So… they came to the house. Very thankful for the late night service call. Bummed that he turned my sophisticated vapor system into an all-night knocking full water gravity heat system. The technician was not at all familiar with the system and filled it with hot water. But we had heat! The next day, I had to call Wayne to completely restore the system and replace a few parts. It was this experience that I realized Wayne was far more than an HVAC contractor. We often do not really get to know the many men and women who come in our homes on a regular basis and repair our appliances… patch our roofs… clean our sewer lines… Due to my line of work I actually spend a better part of my time with many contractors. It has proven to be one of the most rewarding parts of my career and the lessons learned and the friendships. I have referred Wayne to many friends, family and clients and at times we all often refer to Wayne as “the genius”. Wayne has not just learned his trade by basic training and trial and error. If Wayne were to put together all of his formal training, additional specialty classes, and seminars, I am sure there would be enough there for a Masters of Heating Ventilation and Cooling. Since I have known Wayne, he is always going to specialty sheet metal seminars and continuing educations on coolants, air balancing and a host of other learning sources that make me ask, “Where were you?!?! How do you even spell the title of that class?!?! 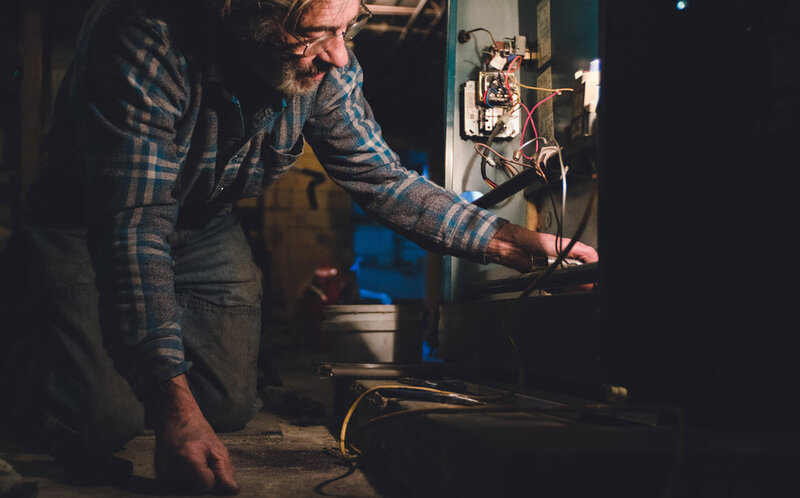 ?” I really do consider myself an HVAC geek and I am fortunate to be able to say that all I have learned about hot water boilers, steam and vapor, heat exchangers and pumps… I have learned from Wayne. The mechanics are fascinating and to be able to understand exactly what I am looking at when going into houses with clients has been priceless. The heating and cooling system is one of the major systems of a home that is the heart of the home. Back to Part Deux! Obviously I called Wayne that -3F January day. I NEVER call Wayne on his cell. I call Wayne the old-fashioned way. Call the office landline… listen to his wife, Maureen’s, voice announce that nobody is able to take the call at Alpine Heating & Air, leave message knowing full well that Maureen is going to call or page (yes… page) Wayne and he will call me back in about 30min or less. Well, on this day, I was calling his cell. And when he answered, I remember as if it were yesterday because I could hear the surprise in his voice that I was actually calling him on his cell. He stated he would be at the house in less than 2 hours. By the time Wayne arrived I had done even more investigative work including going out to the hardware store to get a number of tape type wraps claiming to stop leaks of all kinds! To an extent, they worked and would have worked even better if the elbow that burst was not buried deep in the wall cavity. Immediately, Wayne gives me the best plan of attack, but never the worst case scenario. Why even go there when it is time to get concentrating on getting this fixed now?!? And to do that… we needed to get that elbow out of the wall cavity. A task NOT for the faint of heart or muscle… or balance… or fear of falling 50lb pipe wrenches. So this is where it became a family affair. If able, I am always wanting to be at home when Wayne is working on anything in the house. But today I knew I had to be home. This was going to be a big job. Not big as in complication or size but this is an almost 80 year old heating system set into a 130 year old home. These pipes are black iron going into cast iron radiators. This isn’t thin copper and solder. These are threaded steel pipes. They have not been turned, unscrewed, touched, moved… in 80 years since they were installed. Getting these pipes apart at their threaded joints and “unions” had Wayne and I each with a pipe wrench the size of a small person and Wayne saying… “OK… you push that way! I’ll pull this way!” Well, after an hour or so of that going absolutely nowhere… it was time to bring in the serious muscle...my wife. And Julie doesn’t fool around or hesitate a bit. It was getting colder in the house by the minute. “Let’s go! ", she said. So now Wayne is up on the ladder as the pipe is up to the ceiling. Julie is backing up Wayne's power at the end of their wrench and I have my own going the other direction. This is where we really needed to be careful. It only took one falling 50lbs wrench and all of us yelling “WATCH IT! !” to be alert and coordinate precisely. Is was after another hour of nothing but brute force from the 3 of us to realize we were headed to the worst case scenario. It was time to cut the pipe. The union was completely seized. *Wayne uses an almost 50-year-old machine to add threads to the cut black pipe. But first… dinner time! Why is it that when things go wrong in your house, they are almost always at night… or weekends…? Well if dinner is served and Wayne is still there, he is getting dinner. I’ll tell you now I know his favorite in our house… Pesto Pasta with Door County Potato Sausage. After we were all fed and happy, we embarked on a job both weighty yet simple, straightforward yet demanding in its endeavor. First, we cut the basement horizontal pipe and installed a shut-off valve which allowed us to get the heat on. What needed to be completed the next day was going to be just as daunting as the past hours had been. End of Day One and it was 9pm at night. Wayne had been with us for 7 hours. With the elbow inset in the wall cavity there is no way to access it to disconnect the thing, but to try and unscrew the two pipes that go into it. This is why getting the basement horizontal to free up was so crucial. After that failed attempt, cutting the pipe was the only choice left. What about the other pipe that makes up the feed? The pipe that rises to the 2nd floor master bedroom where the huge radiator is located? This vertical pipe is called the “riser”. If this thing doesn’t have more success in coming free and turning out of the elbow in the basement… disaster. We go from a two-day job to who knows because the whole line of pipes would need to be removed, and they go through the floor structure up to the 2nd floor. Sometimes, you walk into an old Victorian and see exposed painted pipes running vertical in the corner of the room and wonder, what is that? That is a radiant form of heat that was installed after the house was built. Day Two starts and we head to the 1st floor living room where the riser is located. Time to take a wrench to that thing. With me on the wrench and Julie and Wayne in the basement at the wall cavity by the elbow and connected by cell phone for communication (the floors in this house are at least 16 inches thick), we slowly coach each other to the end goal of getting the riser disconnected from the elbow below. Success! Finally. While Wayne prepares the new elbow for install, I head back outside to crawl under the front porch to continue insulating and filling the gaps and holes in the foundation. (See? You gotta read Part 1). *Here you can see how the heat pipes were retrofitted into the home in the 30’s or 40’s. Yes… that is straight into the top block portion of the foundation. In the end, Day Two was an additional 4-5 hours worth of work for all three of us. We would NOT have had the problem fixed any other way. *This closer look shows the elbow finally fixed and the heat flowing once again. Newer Post Thank you D97!! !